[Editor's Note: The following analysis was published on May 7, 2013 at Socialist Worker and is reprinted here with permission. Lee Sustar is also working on a book about the Chicago Teachers Union and the work that went into the Chicago Teachers Strike of 2012. The URL for the original article is: http://socialistworker.org/2013/05/07/will-the-ctu-keep-moving-forward]. 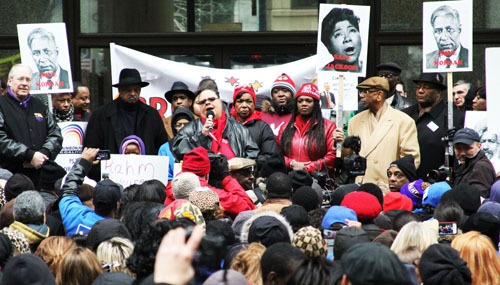 Chicago Teachers Union President Karen Lewis, surrounded by community leaders including Operation PUSH leader Jesse Jackson, SEIu leader Tom Balanoff, Alderman Ricardo Munoz, and Congressman Bobby Rush addressed the rally on March 27, 2013 against the school closings being pushed by Mayor Rahm Emanuel. Substance photo by David Vance.The challengers to Chicago Teachers Union (CTU) President Karen Lewis and her slate in upcoming union elections are fishing for votes by raising questions about the contract negotiated in last fall's strike, from an unpopular health care plan to a longer workday with modest pay increases. But when the top candidates debate before CTU delegates May 8, Tanya Saunders-Wolffe and Mark Ochoa, the opposition candidates running against Lewis and CTU Vice President Jesse Sharkey, will have plenty to answer for themselves. For one thing, as members of the union's bargaining committee, if they had these concerns during the strike, why didn't they raise them when they could have had some influence? Perhaps the biggest question the opposition must answer is why it exists at all. It's composed of longtime rival groups, both of which formerly held office — the United Progressive Caucus (UPC) and Pro-Active Chicago Teachers (PACT). For more than a decade, leading members of the two caucuses accused each other of corruption and incompetence, filed lawsuits against one another and even scuffled on the floor of CTU delegates' meetings. When the UPC ousted PACT from office in 2004 union elections, outgoing CTU President Deborah Lynch refused to accept the results, locking the winning UPC slate out of union offices until forced to vacate the premises by the CTU's parent union, the American Federation of Teachers (AFT). Now, however, the leaders of PACT and UPC recognize that they're too weak to win union office alone. So the people who once traded insults like rival professional wrestlers are now standing together, arm in arm, in the rather dramatically named Coalition to Save Our Union, which seeks to oust the Caucus of Rank-and-File Educators (CORE), which swept to leadership positions in the last union elections in 2010. The challenge comes despite the success of the union's first strike in 25 years — a strike that halted the momentum of the corporate education reform agenda pushed by an aggressive Mayor Rahm Emanuel, one of the most powerful politicians in the U.S. At a time when school systems in New Orleans, Detroit, Cleveland and Philadelphia are undergoing sweeping privatization and elimination of traditional job protections for teachers, the CTU held the line. Yet now, Saunders-Wolffe and Ochoa are trying to take down Karen Lewis and CORE. That's an outcome that would delight Emanuel and the Chicago Democratic Party establishment. Tellingly, Marilyn Katz, a public relations consultant with long experience working with liberal Democrats, is serving as a paid adviser to the CTU opposition. To assess whether the CTU opposition's challenge is credible, it's important to start with the overall results of the strike. The contract settlement  did give ground on issues the CTU leadership wanted to avoid concessions, such as a shortened time for displaced teachers to get full pay and an intrusive "wellness" program in exchange for a freeze in health care costs. Pay raises are modest in view of the longer school day — although "we're not in front of kids any longer," points out CTU member and CORE activist Tammie Vinson. Teachers' base pay increases don't keep pace with the longer hours, but teachers will continue to get raises based on years of service (step) and educational attainment (lanes). Emanuel was determined to eliminate these raises — and impose merit pay as well — but as the Wall Street Journal noted with disappointment , he failed to do so. Emanuel had also targeted teacher tenure and sought to wipe out job security protections negotiated over decades of collective bargaining agreements by pushing a "thin contract" that would have concentrated sweeping powers in the hands of principals and school administrators. The CTU not only held the line here, but won new contract provisions to challenge bullying by principals and revitalize the Professional Problems Committees, which give union chapters the ability to negotiate issues with principals before filing grievances. The contract also provides teachers relief from the ever-growing paperwork requirements and establishes teacher control over lessons plans. Saunders-Wolffe and Ochoa are also trying to score points against CORE by citing the teacher evaluation system imposed under state law known as the Performance Evaluation Reform Act (PERA). CTU leaders "think the discipline [contract language] is a win," Saunders-Wolffe said following the April union delegate meeting. "It's not a win, once you look at it. It's easier for principals to get rid of teachers." What Saunders-Wolffe fails to mention is that PERA was passed in January 2010 when the UPC was still in office — and the former leadership failed to mobilize the union to fight that attack. There are other gains from the strike that can't be measured in the contract. By making a defense of public education — and highlighting the racism and economic inequality that pervades the Chicago Public Schools — the union took up a struggle for working people across the city. So when more than 20,000 union members descended on downtown Chicago last September 10 for a rally on the first day of the strike, support for the CTU was widespread — not only from members of other unions, but from parents and working people across the city. The union has taken a similar approach in the fight against the proposed closure of 54 schools, allying with community groups in the predominately African American and Latino areas where most closings are targeted. The CORE leadership has also established the openness and union democracy that the UPC long feared — and that PACT promised, but failed to fully achieve during its time in office. Neither of those caucuses would have dreamed of establishing large bargaining committees of rank-and-file teachers, let alone including members of rival union groups. But CORE, seeking the widest possible unity in the CTU's showdown with Emanuel, made sure that members of PACT and UPC were in on negotiations from the outset. If they had any gripes about the contract then, they kept it to themselves — and voted to approve the agreement. How could the reformers in PACT, a group founded to clean up and democratize the union, now make common cause with those it accused of cronyism and self-dealing? How did the once-mighty UPC, which led nine strikes in 18 years, from the late 1960s until well into the 1980s, crumble under the onslaught of corporate school reform before collapsing with a split in the leadership that led to the expulsion of a union vice president and ouster of a treasurer? THE UPC did have its heroic period. Founded at the end of the 1960s, it brought together a group of mostly white union militants led by high school teacher and Army veteran Robert Healey, with African American teachers. The faction headed by Healey was fed up with poor compensation based on handshake deals with Mayor Richard J. Daley. The Black teachers shared those grievances, but also had to endure racism in the credentialing process that relegated a large proportion of Black educators to the role of substitutes. The CTU went on strike nine times in 18 years, making it arguably the most militant teachers' union local in the U.S. In the 1980s, Healey moved on to head the Chicago Federation of Labor and Illinois Federation of Teachers. He was succeeded by Jackie Vaughn, a dynamic African American woman who maintained the union's militant traditions. Nevertheless, the UPC ran the CTU as a one-party state and sought to marginalize opposition. If the CTU maintained itself as a fighting union, it was in part due to continued pressure from the left in the rank and file, where a tradition of self-organization and militancy had taken root since the 1960s. Substance newspaper, originally focused on the issues of substitute teachers, became a widely read alternative to the official publications of the CTU and a vehicle for several opposition currents. Substance editor George Schmidt got 40 percent of the vote for union president in 1988  after many teachers felt the settlement of a strike the previous year had sold teachers short. Vaughn's death in 1994 elevated the UPC's Tom Reece to the CTU presidency. A year later, the state legislature gave Mayor Richard M. Daley — the son of the big-city machine boss the UPC had originally contended with — control of the schools in legislation that temporarily banned the union's right to strike and removed critical issues like class size from collective bargaining. The CTU's response was to roll over. Reece was a "barely engaged 'go-along' guy," wrote journalist Linda Lenz. "When [Chicago Schools CEO Paul] Vallas abruptly reconstituted seven high schools in 1997, removing some teachers and scaring away others, the union protest was barely audible. In essence, the CTU went underground." The UPC's slow fizzle was PACT's opportunity. Led by Deborah Lynch, who'd worked on education policy issues and teacher professional developments at the CTU and at AFT headquarters in Washington, D.C., PACT tapped into frustration with UPC's concessions and cronyism. The Substance network played an important role in her win, with the newspaper providing Lynch and her running mate, Howard Heath, an African American high school teacher, with a platform to reach the Black teachers who had long been the heart of the UPC voting base. Under PACT, compensation for CTU officers and staff was reduced. Dues payments were cut. Union budgets were cleaned up. Membership representation and contract enforcement were revamped. Community outreach, long neglected by the CTU, was taken seriously. Even so, the demands of running the office absorbed the energies of PACT. According to Heath, PACT was simply a vehicle for Lynch to sell her policies, rather than a means to develop an activist network. "We never worked to build a caucus," said Heath, who said he and other officers were marginalized. This isolation from the membership proved disastrous for PACT when Lynch negotiated a contract in the fall of 2003. Lynch claimed to union delegates that the deal wasn't just bringing home the bacon, but the "whole hog." Union members thought otherwise. The contract was voted down, mainly because of concessions over health care. Lynch put up a picket line at a high school, talked about a possible strike...and went back to the bargaining table. "There was no credibility behind that" strike threat, Heath said. "It was a scam to even talk about it." The subsequent deal was somewhat better, but still contained givebacks. With no serious preparation made for a strike, however, members voted for the contract. They made their displeasure with Lynch known a few months later, ousting her in union elections by a margin of little more than 500 votes. Lynch's claims of vote fraud were rejected by the AFT. The UPC was back in the saddle. Lynch and PACT hadn't been able to withstand the relentless pressure of the corporate education reformers. While it's true that PACT's reformers were a relatively small group and that old-guard UPC members who remained on the union staff played an obstructionist role, the biggest problem was the limitations of Lynch's brand of teacher unionism. As a 2002 Chicago Tribune article made clear , Lynch remained a proponent of traditional labor-management partnership, rather than the militancy of a mobilized rank and file. "Reform done with teachers will be more effective than reform done to teachers, which is what has been happening in Chicago," Lynch said. But at that point, then-Chicago Public Schools CEO Arne Duncan wasn't interested in input from teachers. He was taking his cues from the Civic Committee of the Commercial Club of Chicago, which had developed Renaissance 2010--a plan to shutter 60 "failing" neighborhood schools and replace them with 100 new schools, many of them run by charter operators or sponsored by business. Announced in June 2004, just weeks after Lynch lost her bid for reelection, Renaissance 2010 would present the CTU with its greatest challenge since the stormy days of the union's founding in the Depression years. Back in control of the CTU, the UPC was less interested in fighting the corporate education reformers than reclaiming its perks of union office. As the attacks gathered pace, CTU President Marilyn Stewart expanded the union payroll and CTU spending, steadily increasing dues to pay for it. She did, however, talk tough during a two-year contract campaign as union elections and negotiations approached in 2007. Stewart won by a 3-1 margin in an electoral rematch with Deborah Lynch in the spring of that year. The subsequent contract agreement reached in the fall of 2007 was part of a plan by Mayor Daley to ensure labor peace in Chicago in advance of the city's bid for the Olympics. The price was 4 percent raises in each of the following five years. Even so, the deal didn't sit well with a sizeable number of union delegates — but Stewart rammed through the a contract recommendation  without even allowing opponents to vote "no." Critics blasted the agreement for failing to address deteriorating working conditions and increases in health care costs. CTU members approved the contract in a subsequent vote. But dissent in the ranks soon had an impact on the top echelons of the UPC. According to longtime union activists, then-CTU Vice President Ted Dallas began voicing his sympathy with members' anger during his visits to schools. Stewart counterattacked, expelling Dallas from the union in the summer of 2008 after a trial conducted before the union's executive board and removing him from union office. The official charge was misuse of union funds — according to a 112-page document  released to executive board members, Dallas misspent funds on dinners and drinks at "union meetings" at upscale restaurants. He was also accused of cashing out $17,725 in sick days. According to the Chicago Sun-Times , Dallas, in turn, accused the Stewart administration of spending $500,000 on meals at the union's expense and paying $100,000 in union promotional items purchased from a company owned by two union officials. The union treasury, which had more than $5 million when Stewart took office, had to be shored up with a $3 million loan. Stewart also seized control of the duties of then-Treasurer Linda Porter, handing them over to John Ostenburg, the union's chief of staff at the time. Ostenburg, a central player in the Stewart administration, never taught in Chicago schools. He was a journalist-turned-public relations man, a former state representative and the mayor of a Chicago suburb of Park Forest. Dallas sued the CTU to win an undisclosed financial settlement and reinstatement of his union membership — and later won another $100,000 when the CTU violated a gag order concerning the case. If Stewart was looking for egregious misspending of union funds, she could have started with a look in the mirror. She collected $178,116 salary in 2009  — along with $95,000 salary for a part-time job as secretary-treasurer of the Illinois Federation of Teachers. The big spending went beyond the CTU's executive offices, however. The union's field representatives, who'd organized a staff union in the waning days of the Reece administration, typically hauled in salaries of around $140,000 per year, plus a $240 per month cell phone allowance, a $1,000 per month car allowance, a further 85 percent reimbursement for car expenses, and a 21 percent annuity, in addition to their regular teacher pension plan. As the 2010 CTU elections neared, the CTU was nearly broke and paralyzed by the civil war in the UPC. Meanwhile, the upstart CORE had taken the lead in organizing to stop the school closure agenda pushed by Duncan and his successor, Ron Huberman. A CORE forum on school closures in January 2009 drew 500 community members and teachers despite a blizzard. Marilyn Stewart concluded that she'd better try to put herself at the head of that effort and spoke at the event. But it was unmistakably a CORE event. When the Board of Education pulled back on some of the school closures, there was a sense that activism and community alliances could make a difference. In the spring of 2010, when schools chief Huberman threatened to lay off thousands of teachers and dramatically increase class sizes, it was CORE that prodded the CTU leadership into calling a large and militant protest. With the UPC split in the union's 2010 vote — Dallas' faction had launched the Coalition for a Strong and Democratic Union — CORE was able to make the runoff in an election that saw multiple slates competing, including Deborah Lynch's PACT. All the opposition slates backed CORE in the second round of voting. Once in office, CORE officers cut their pay and used the money to launch an organizing department that would both mobilize members and reach out to parents and community groups. For the next two years, the CTU prepared systematically for a confrontation — first with Mayor Daley, then with Rahm Emanuel after he took over in the spring of 2011. Emanuel had made teacher-bashing central to his campaign and personally intervened to shape state legislation requiring 75 percent of all CTU members to vote to authorize a strike, as well as to impose a longer school day in Chicago. At first, CTU members, perhaps cynical over the failure of previous reform efforts, were slow to respond. Demonstrations against layoffs and corporate profiteering from the schools were decently attended, but not huge. But when Emanuel's handpicked school board used a contract loophole left by Marilyn Stewart to revoke the teachers' scheduled raise, the message got through. It was time to take a stand — or see the CTU finished as an effective advocate for teachers. Emanuel's provocations and the CTU's careful preparations led to the sea of red t-shirts in downtown Chicago last September 10 as teachers swarmed the Loop, shutting down traffic and stunning Emanuel with the widespread support they'd attained. While the UPC-led CTU strikes of the 1970s and 1980s had had their dramatic moments, Chicago had never seen a teachers' strike like this one. The lively school site pickets and daily mass marches were a show of union power unseen in the U.S. in decades. Further, the decision of delegates to extend the strike into a second week to hold picket-line meetings to discuss the tentative agreement was a show of union democracy that Robert Healey or Jackie Vaughn would never have risked. After going 25 years without a strike, the CTU is once again a fighting union. Where the UPC tried in vain to resist attacks by reviving the union's old-school clout and PACT counted on partnership with enlightened elites, the CTU under CORE has revived the best militant traditions of the union and adapted them to 21st century challenges. A big vote for CORE will send a message to Rahm Emanuel and the corporate education reformers. At a time when teachers' union locals across the U.S. are surrendering decades of hard-won gains, the Chicago Teachers Union under CORE has held the line on key issues and even made important gains. If CTU members want to keep their union moving forward, their choice at the May 17 union election is clear: Karen Lewis and the Caucus of Rank-and-File Educators slate. I predict CORE will win with 80-95 percent of the vote.